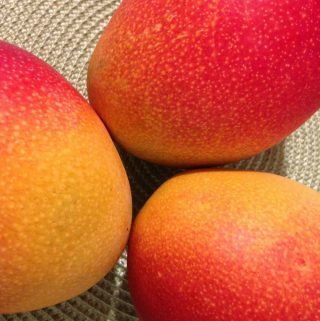 When I can get good mangoes, my favorite breakfast of all time provides about 50% of my daily protein requirement and 80% of my daily Vitamin C requirement – and all for around 300 calories. The best thing, though, is that my *fav* tastes like dessert! 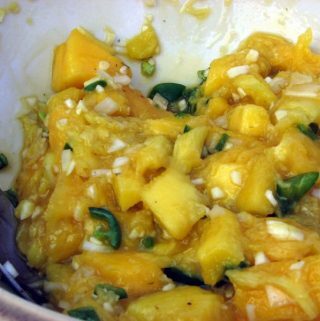 Then I cut a mango or two’s worth of slices and put them in the food processor and blend the mango and yogurt together until the whole concoction is super smooth. What comes out is something akin to mango pudding. It is to die for good – and so healthy! I scrape the mix into a mug with a spatula and enjoy with the help of a few (quiet!) slurps and a spoon. The consistency comes out thicker than a typical smoothie, which I like because it feels like more of a meal. Mango and FAGE make for that rare and divine combination that can satisfy health nuts, dieters, and gourmets all at once. What a meal! And when mangoes aren’t to be found, I substitute bananas, which also make for a delicious, healthy breakfast.